This is the most popular route of hiking the mountain as it is the most easily accessible and hikers get to the main peaks in the shortest time possible. It is also the most dangerous in terms of AMS as it involves a gain of over 1000m in one day! 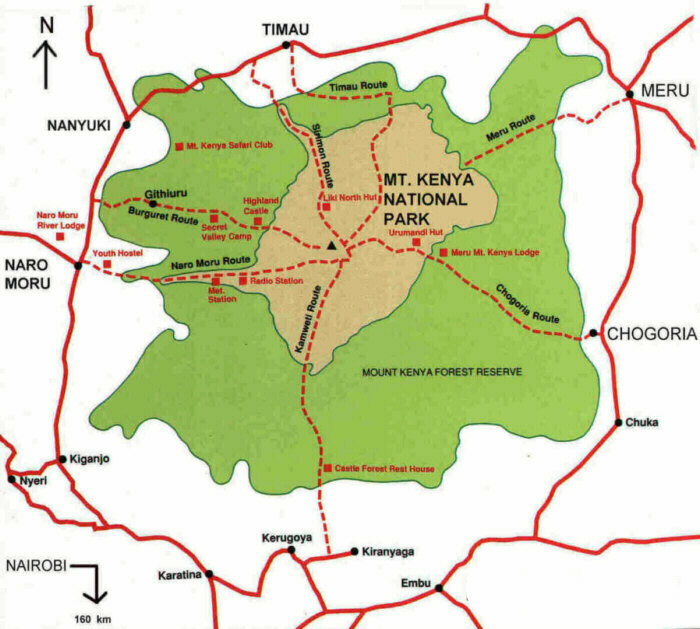 Transfer from your hotel in Nairobi and drive to Naromoru park gate (alt.2700m). On the way sample the spectacular views of the Kenyan white highlands, the outstanding Aberdares ranges arriving at the park gate in time for lunch .Start an acclimatization hike up the tropical forest arriving at the Met station (alt.3050m) in the late afternoon. Dinner and overnight at the camp. Depart the camp after breakfast and with picnic lunches attempt the vertical mud which is very boggy but all the same very exhilarating! Lunch on the way at a designated point arriving at the Mackinders camp (alt 4300m) in the early evening. Dinner and overnight at the camp. Wake up early at 02h30 hrs. Have a tasty cup of tea/ coffee and start the hike of the summit peak-Point Lenana (alt.4985m) which is the highlight of our trip! Take some photos with the spectacular African sunrise! and later descend down to the Mackinders camp where we will have some breakfast. Rest for a while and later descend further down to the Met station where we will have some dinner and overnight. Depart the camp after breakfast and walk down the forest vegetation to connect with the transfer vehicle to Nairobi.